First, choose between human hair ($400 - $800) or synthetic hair ($10-$40). Human hair appears natural, can be colored, needs to be treated delicately and is more expensive. If you are looking for volume, synthetic hair creates more volume however cannot be styled with hot tools. If adding fullness, purchase 2-4 ounces of hair. If adding length, purchase 6-8 ounces. Once you have your hair, consider how your customer styles her hair. How you part her hair before applying the extensions will dictate how the hairstyle will fall for the finished look. Wash and condition the hair and blow it out with a paddle brush to ensure there are no knots or snarls. Create a part for the extension. Start with a horizontal parting that goes from temple to temple. Comb up the hair above the part line and clip it into place. Part the hair again just a tiny bit under the first part, creating a very thin line of hair. This will be the hair for your cornrow and will serve as an “anchor” where the extension will be sewn. Pull the hair below your cornrow part and secure it tightly out of the way. CREATING THE CORNROW: It is absolutely necessary to start the cornrow at least 1/2 inch from the hairline, otherwise the extension will show. While braiding work horizontally towards the center of the head from hairline to hairline. Start with a small amount of hair and begin your braid. Remember if the braid is too thick, it will create a bump under the extension and poses difficulty drying later on. Keep the braid tight and consistent. Finish with a rubberband. PREPARING THE WEFT: A single hair extension is called a weft. Cut a piece of extension thread ($4-$8) about 48 inches long and thread it through the needle ($3.50), pulling the thread until there is an equal amount on each side. Before you secure the weft, trim it to be the same length as the braid. For a weft folded in half to create extra fullness, take your needle and insert it through the folded edge so it his held together on the unfolded side. A folded weft must be double the length of the braid. 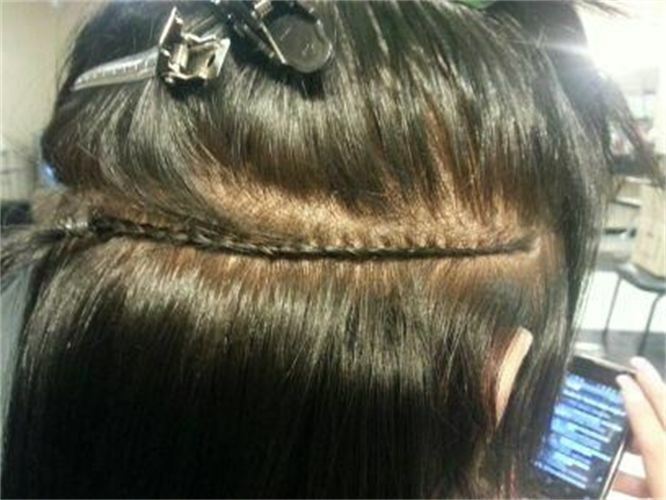 SEWING THE HAIR: The first stitch goes at the end of the weft closest to the hairline. Insert the needle under the braid and bring it up. Continue threading through the cornrow. If you are working with a folded weft, be sure needle goes through both tracks. Once you thread your needle to the end of the cornrow, insert the needle through the loop you left at the end of your last stitch and pull it through, firmly attaching the extension. Knot the end two or three times for security. FINISHING WITH A TRIM: Trimming extensions at the end of this service will create a natural appearance.